Fungal community of grapevine trunk diseases: a continuum of symptoms? The use of Cochliobolus sativus culture filtrates to evaluate barley resistance to spot blotch. A new species of Guepiniopsis (Dacrymycetes) from Greece. The genus Athelopsis (Atheliales, Basidiomycota) in the Patagonian Andes. Domestication of wild strain of Pleurotus giganteus. Molecular phylogeny of Pilaira (Mucorales, Zygomycetes) inferred from ITS rDNA and pyrG sequences. The genus Leptogium (Collemataceae, Ascomycotina) in mainland Portugal. Two new species of Hypoxylon from China. 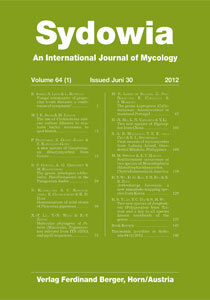 First records of Myxomycetes from Lubang Island, Occidental Mindoro, Philippines. Southernmost occurrence of two species of Monoblepharis (Monoblepharidomycetes, Chytridiomycota) in America. Arthrobotrys koreensis sp. nov., a new nematode-trapping species from Korea. Two new species of Junghuhnia (Polyporales) from Taiwan and a key to all species known worldwide of the genus.